Could the human species, as it exists today, be a transplant or alien to the planet Earth? Modern science would have us believe that human beings evolved over millions of years from ape-like hominids in Africa. But the evidence to support this theory is slim, and what evidence is available actually suggests that the human race is a mix of different humanoid races, some of which probably came from off planet. Firstly, the RH factor is a blood protein that is found in the Rhesus monkey of Africa. That same protein is present in most human beings, about 85%, but a staggering 15% of humans test negative for RH factor. These RH negative blood types could not have evolved from the same group of human beings that allegedly left Africa millions of years ago. To say humans evolved from the same group can't be true because there are two completely incompatible blood factors within the population. If a mother, who is RH negative has a child that is RH positive, the mother's blood could literally kill the child due to incompatibility, although not in all cases; this is not an evolutionary trait from a single stock of genetics. The only thing that scientists can think of to explain the peculiarity is that there must have been some other infusion of DNA into the genome, but from where? While mainstream academia is reticent to entertain extraterrestrial sources, that is one explanation. Another explanation is that there were different kinds of humans developing side by side for eons of time, and eventually one species won out over another. The story get's more interesting though. I learned about this article while listening David Wilcock at the consciousness life expo this year. He presented the following article. Geneticists used forensic DNA testing to trace lineages of males and females back to their earliest ancestors. The researchers dated the existence of this man by comparing the Y-chromsomes of 753 Icelandic men, who were also grouped into 274 paternal lines. The researchers used a “molecular clock”, based on the number of DNA mutations that arise with each generation, to estimate Adam’s age. [...] the new age for genetic Adam at between 174,000 and 321,000 years ago. Genetic Eve is thought to have walked the Earth around 200,000 years ago: well within the new error margin for Adam. What this means is that using genetic testing, the most reliable form of generational tracking we have available, they were able to demonstrate that the first 'human beings' are much younger than the original the million-year-old figure proposed by scientists earlier. This shattered the proposed view of human evolution, wherein scientists assumed it took millions of years to progress from apes to modern man. Considering how off mainstream science was from their prediction, perhaps we should consider alternative theories. So what happened to Atlantis, if it existed at all? We can only speculate, but what we do know for certain is that major and minor cataclysms or deluges have ravaged the surface over eons of time. These cataclysms happened in cycles, reaching back millions of years. Other scientists recently found that a mysterious group of humans replaced the native population about 15,000 years ago. It was probably this latter day mystery group that we trace our origins from. So what this tells us is that the history of the planet is far longer and more complicated than previously thought. And that different groups of human beings, of various cultures, and levels of advancement, have existed for at least 250,000 years. But where did these other groups of humans come from? And could there be not one, but many different human groups that all contributed to the current stock we have now? The evidence is clearly suggesting that there were many periods of rising and falling civilization, especially if we consider ice age cycles. So with this foundation now firmly in place, let's consider an otherworldly theory. David Wilcock is a researcher who has access to insiders who have access to science that the public does not. Some of these insiders claim to be in highly advanced secret space programs, that are so beyond the level of advancement we see in the world today, we could easily confuse their technology as being extraterrestrial. Wilcock was told, via various insiders, and was able to confirm using historical accounts and scientific inferences, that humanity is much older than previously thought, and that the current population that resides on the surface is actually a mixture of several different human stocks. He's been covering this in his weekly series Wisdom Teachings on gaia.com. Within the secret space program, the oldest known race to have existed in the solar system is called the Ancient Builder race. As seemingly bizarre as this sounds, let me just put the narrative Wilcock has been able to gather out there for you to consider, this is only the pertinent points to our current discussion, the actual history, as told by Wilcock, is much more in-depth. Approximately 2.6 billion years ago, a race of human-like beings evolved in our solar system on the planet Venus. These beings were very tall, about 80 or 90 feet in height, extremely advanced technologically, and benevolent in nature. Using their advanced technology, they erected an energy barrier around the solar system to protect it from hostile species. Eventually, this race evolved so far beyond what we consider normal, they ascended to another plane of existence, but before they did, they left ancient ruins all over the solar system, and the energy barrier was left to defend the solar system against aggressors. Much much later, some 500,000 years ago, long after this ancient builder race left the solar system, other native human type beings evolved on a planet that is orbiting where the asteroid belt is now. That planet was called Maldek or Tiamat, a super-Earth-sized planet that had several moons, one of which was Mars. On the planet and Mars, the moon, were aggressive races warring with each other. They found a way to access the Ancient Builder race technology, and eventually attempted to use it in an effort to destroy their enemies. But something went horribly wrong, and instead, Tiamat was destroyed in a huge conflagration, sending debris shooting out everywhere in the solar system, and propelling Mars to where it currently resides. Apparently before this happened, the energy barrier came down, and a host of less benevolent races entered the solar system. These races saw what was coming for the warring Martians and Tiamatians, deciding to move them to the Earth in a type of cosmic refugee relocation program. But when they got to Earth, there were already races living there, some existing below the surface in huge cities underground. These inner-Earth humans claim to have existed below the surface for 20 million years, coming to the surface on occasion to help survivors of these periodic cataclysms that ravage the surface. The refugee humans that settled here after the Tiamat disaster were more aggressive and war-like than the natives. Over eons of time, the inner-Earth peoples stayed underground while the surface was ravaged by cataclysm after cataclysm. They would select the cream of the crop from the surface to make contact with, offering support to in an effort to restart civilization. These civilizations rose and fell for eons, eventually developing the legendary civilization of Atlantis we hear about in modern times, but this was hardly the first advanced civilization to develop during these cycles. While there is very little above board evidence to support this narrative, we do have the Sumerian culture that sprang up nearly complete out of antiquity. This culture did not slowly accumulate technology, developing over hundreds of years, instead, it appeared out of nowhere, and within the historical documents left behind, it claims to have been assisted by godlike beings. One final piece of evidence we have, again courtesy of David Wilcock, is the account between Solon and the Egyptian priesthood, as told by Plato. Essentially what the priesthood is saying here is that Solon is only aware of a very short window of history and that the true history of humanity reaches back much further. It is this same Egyptian priesthood who would form the basis for almost every other secret society on the planet. And we have learned from these societies, that many of them claim to have come from hybridized human beings who were decided from extraterrestrials or settled here from off world. So when we compare legend and myth to recently discovered DNA evidence, an interesting picture begins to emerge. Giant humans have been found all throughout the Earth, and the Smithsonian Institute even been found to have destroyed several skeletons in the 1800's. Perhaps there was more to these legends of old than modern day scholars would care to admit. Thankfully the truth is out there, we need only continue our search of it, to be empowered by the treasures it has kept for us over oceans of time. The full RH blood factor article is listed below for reference. 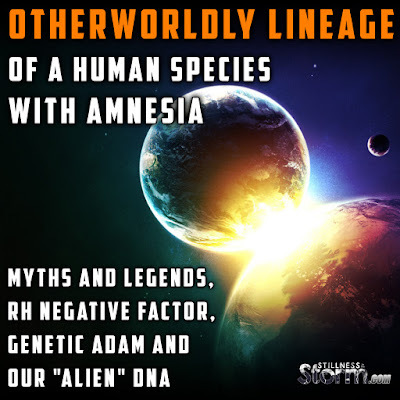 Much has been said about Rh negative blood and theories which suggest, there is an enigmatic truth sealed away from public knowledge linking humans with Rh negative blood to otherworldly origins. Humans have four general blood types: A, B, AB and O; a classification derived from proteins found on the surface of cells which are basically designed to wage war against bacteria and viruses in the human body. Whether Rh negative blood is just a mutation or not is something that has caused debate among researchers. If it were a mutation, then why is it that people who possess Rh negative blood are known for having extra vertebrae? This, just as the blood type, is explained scientifically as being a ‘mutation’. However, according to modern DNA sequencing, it is demonstrated that humanity as we know it, isn’t just ONE single ‘race’ that descended from the same ancestor in Africa, but a hybridized species, with a far more enigmatic truth behind it all. Many questions have been raised in the discussion about Rh negative blood. If mankind did, in fact, evolve from a mutual ancient African ancestor, theories state that everyone’s blood would be compatible, but regrettably, this is not the case. This raises numerous questions that science alone has not been able to fully answer. Where did Rh negative blood come from? And why is it that a Rh negative mother carrying Rh positive children tries rejecting her own offspring? Is it possible that this can be explained by a rather controversial theory? A theory which suggests that humanity isn’t in fact one race, but a hybridized species. Rh factors or ‘Rhesus factor’ was first discovered in the blood of Rhesus monkey. According to Sepehr, if mankind evolved from the same African ancestor their blood would be compatible, but it is not. 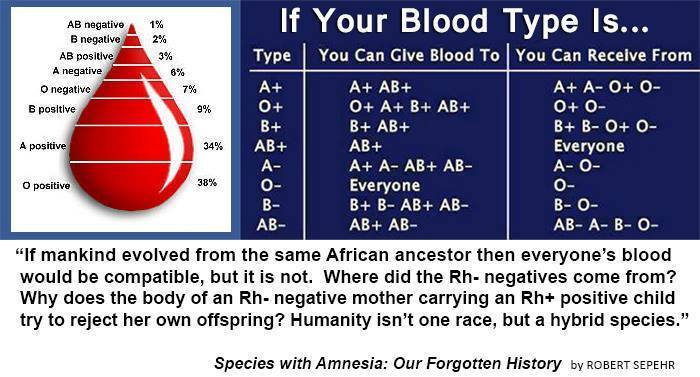 Nearly 85% of all human beings have RH positive blood, yet ALL royal families have Rh negative blood. It seems that science cannot answer the question: Where did the Rh negatives come from? Are we in fact a species with amnesia? And is it possible that the truth behind our origins is far more enigmatic than what we think? Many believe that Rh negative blood would be the legacy that the Anunnaki left on Earth among other things. Interestingly, the negative RH strain is characteristic, for example, of the British royal family, which has generated controversial theories about a possible extraterrestrial lineage. although this hypothesis has not been confirmed, the disturbing questions it generates floats in the air: how civilized world would react to the fact that a small portion of the Earth’s population has a genetic code that has been altered in the distant past by highly advanced extraterrestrial beings.